Evoking rasa in a performance is the pinnacle of the Indian arts tradition. The rasa-bhava concept is integral to Indian performing arts and is explained in great detail in Bharata Muni's Natya Shastra. However, while extensive studies have been conducted on this subject, its practical applications are often lost in the theoretical analysis, disengaged from a contemporary outlook and understanding. G. Venu, dancer, scholar, and devoted practitioner of Koodiyattam, has developed a unique training program in acting/expression that allows for a practical application (and understanding) of particular aspects of the Natya Shastra, one that incorporates breath, imagination and sensory awareness to invoke the feeling and mannerisms of a particular character. This unique system has been growing in popularity amongst actors, dancers and other artistes seeking a means of channeling emotions in a systematic manner. Using his extensive experience and study in Kathakali and Koodiyattam, Venuji has answered the question that so very many artistes/dancers ask: is there a way to 'practice' abhinaya/expression? The Navarasa Sadhana technique allows for a systematic and routine practice of each of the nine rasas. I participated in my first 'Navarasa Sadhana' training several months ago. A two-week residential training away from the everyday hustle and bustle of daily life on the sprawling, lush grounds of the Natanakairali campus, seemed the most idyllic setting for a workshop of this kind. Truthfully, whatever literature I had read about Navarasa Sadhana beforehand did not quite prepare me for my very first experience there. Our daily training was essentially divided into three parts: Eye/breath exercises (incorporated from Koodiyattam training), which helped to control our eye movements/expression, enhance projection, and breath control; Navarasa training, which involved using focused breath (in the form of sound), engaging all of the five senses, along with our imagination, to evoke a particular rasa. During this part of the training, Venuji would walk us through various exercises to understand, access, and express each emotion, followed by the specific set of exercises/kriyas that had been established as part of the Navarasa routine. The third part of our training consisted of afternoon improvisational exercises (presented individually) based on vyabichari bhavas, or the transitory states, as mentioned in Bharata's Natya Shastra. The improvisational sessions were a critical part of the training, as it allowed for the individual imagination to build the framework, and ultimately the emotional state for himself/herself to work within. The emphasis of these exercises was less 'performative' and rather to create an experience for oneself to imbibe a particular emotion. 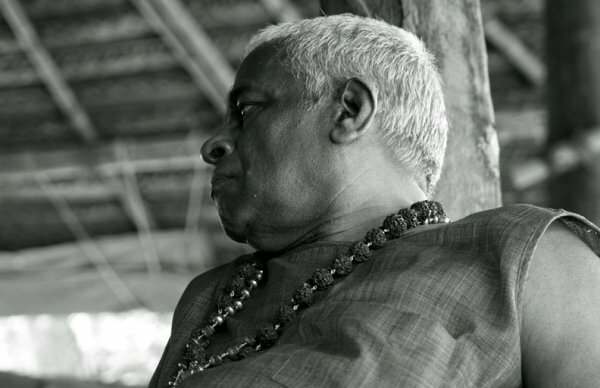 Interestingly, the vyabichari bhavas were only to be practiced once, as it only required that the actor feel that experience one time to be stored into the body's memory. The Navarasa Sadhana practice is particularly unique in that in its design, it is the only training program that includes all 33 of the vyabichari bhavas. While my first session of Navarasa Sadhana can be described as 'cathartic' on many levels, introducing me to a new path to understanding emotion and expression, the second phase felt like an entirely different experience for me. For starters, having attended the previous workshop, there was already an understanding of the culture and dynamics at Natanakairali and Navarasa Sadhana, the familiarity of which actually made it easier to fall into a daily 'rhythm' or routine during the training. The second phase was structured similarly to the first, offering a continuation/revision of what we had covered in the initial training. While revisiting the Navarasas, we spent the first few days focusing exclusively on Sringara Rasa, which was the only rasa that was elaborated upon in phase two of the training. This time around we began to explore gender as part of Sringara Rasa, learning how to manifest both the female and male attributes and mannerisms. In Indian theatre, the highest form of training is when the artiste can perform both genders with complete honesty and without a trace of exaggeration or satire. The initial focus of Sringara rasa in phase two was breath (in this case, it was through the voice - singing, reciting, etc.). After focusing on sound, we then took on the persona of both the male and female as part of the exercise- in body language, gaze, physicality, etc. The ultimate goal of this process was to limit the space around us, so that we could inhabit the character psyche, persona and energy of either gender, eventually reaching a state of 'neutrality' or both genders at will. I particularly enjoyed this aspect of the training because it allowed us the space to think deeply and really feel gender beyond a superficial rendering. Each day we probed deeper and deeper into both the masculine and feminine energies. In phase two of the training, we also reviewed (with more detailed fine-tuning) the other rasas (Raudra, Veera, Karuna). Having earlier learned all of the rasas and associated exercises/kriyas for each, phase two allowed for a more seamless transition between emotions. The second phase of Navarasa Sadhana allowed for explorations of multiple vyabichari bhavas, unlike before, where we explored the various aspects of one vyabichari bhava - ('Nirveda' -despondency). Phase two was a bit of a challenge in that the vyabichari bhavas and variations were subtler. For example, "Glani" or weakness (of the body), may not seem very difficult to emote, as it is a physical manifestation. But the variations of 'weakness,' required more analysis: 'Pattini' or weakness because of starvation (but not poverty-induced), is different from 'manasandapam' or weakness because of depression. The variances in emotions were very subtle in the second phase, so it required more analysis, understanding and internalizing of the emotion. The second phase of the vyabichari bhavas also introduced a couple of group improvisational sessions, which again was another very interesting exercise to see what personas/situations emerged, and how the "story" took off (or didn't). Similar to the previous phase, we presented the full Nava Rasa technique in front of a live audience. In preparation for our final presentation, we were accompanied by live drumming, which really changed the dynamics of the technique. For me personally, the drumming immediately helped focus my concentration almost to the point of entering a trance-like state. With live music accompaniment, the rasas become even more vivid and involved. On the last day, despite having presented our Navarasa Sadhana technique on an elevated 'stage' in front of an audience, the process was so involving that I was unaware of their presence. However, unlike the first phase, where I had felt light and 'released' after the presentation, the second phase left me so in character and with so much intensity of emotion, I felt completely exhausted when it was over. But this only demonstrated the efficacy of Navarasa Sadhana, where these various exercises and improvisations, combined with breath control and imagination are used to understand and initiate the emotional state. The second phase of Navarasa Sadhana was a truly enriching experience for me, one that reaffirmed my commitment to the training process. As always, Venuji was very generous in extending his vast reservoir of knowledge, and to our delight, shared many wonderful memories of the time spent with his own Guru, the legendary Ammanur Chakyar. This phase of Navarasa Sadhana really deepened my understanding of the technique itself and gave me the space to reflect and further observe and understand my own emotions. It has been an incredible contribution to my growth and development as an artiste. Sonali Mishra is an Odissi dancer, researcher, and writer currently based in Bhubaneswar.